This travel guide for Baku includes the local tips for best restaurants, excursions, shopping districts and the attraction points in the city. In the largest city of Caucasus, the sun shines upon both the west and the east, the old and the modern. Baku is the junction point and bears its title perfectly for centuries. 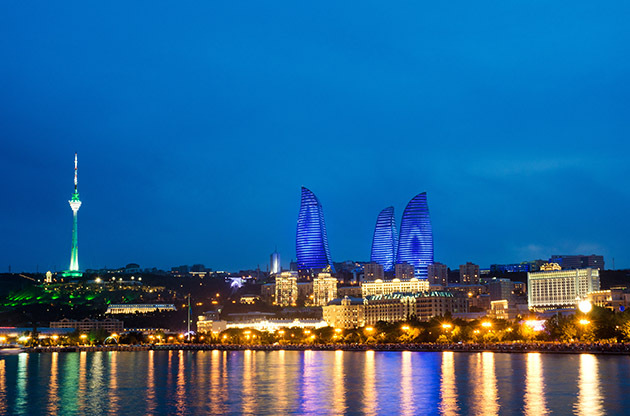 Being the cultural and the economic center of Azerbaijan, Baku draws many international tourist and impresses them with its rich history and multiculturalism. When you wander around the city, it is common that you see shiny high glass skyscrapers and at one side and when you turn your head to the other side, old traditional apartments from the Soviet time are there. Baku is just the place where the wind from west and the east clashes. Just a few days are never enough to discover Baku. Palace of the Shirvanshahs, Maiden’s Tower and the Old City are just a start to enrich your vision. The old history of the city has so much to tell you. Shopping is another pleasant activity in the city. Antique shops, street markets and handicraft stalls are fun to walk around and you may find really unique pieces at favorable prices. With its intimate atmosphere and warm-hearted people, Baku will just make you feel at home and inspire you for it’s a country of many parts. If you like to give more meaning to your Baku trip, read more of this travel guide! Baku is located at the east end of Azerbaijan and the west of the Casbian Sea. Heydar Aliyev International Airport is the only airport in the city. It is located 20 km away from the city center and it is known as the largest and the busiest airport in Caucasus. For more detailed information about the transportation options to and from the airport, you can visit the official website of Heydar Aliyev International Airport. Azerbaijani Carpets have a worldwide reputation and Carpet Museum is dedicated to these unique and famous carpets. In Carpet Museum you will have the chance to see different carpets from various periods and of different weaving techniques. Carpet Museum houses the largest Azerbaijani carpets collection and it is located in Neftchilar Avenue. Founded in 1936, Azerbaijan State Museum of Art is known as the largest art museum in the country. The two buildings of the museum houses more than 15000 artworks which are exhibited periodically in parts. In the museum you can enjoy European, Russian, and Eastern art including Persian, Turkish, Chinese and Japanese. Besides, you can also see the easel and book miniatures from 17th and 19th centuries and lacquered miniatures. The museum is located in Niyazi Street and it is open daily except for Monday between 10:00 and 18:00. Located in the Old City, Palace of the Shirvanshahs is one of the most attractive sights in Baku. It was built in 15th century and regarded as one of the most magnificent buildings in the region. In 2000, UNESCO accepted Palace of the Shirvanshahs as a world heritage site. Being the symbol of Baku, Maiden’s Tower is also located in the Old City and regarded as a UNESCO World Heritage Site. It dates back to 12th century and has a distinguished architecture. Apart from the tower itself, the water well that is located at the second floor also draws the attention of the visitors. Fountain Square is a popular gathering place in Baku and houses many fountains as well as shops, restaurants, hotels and cafes. Many popular public festivals, celebrations or demonstrations are held in Fountain Square and it is also regarded as the center of the shopping and the nightlife of the city. Built in 1912, Azerbaijan State Philharmonic Hall has been a popular attraction center in the city both for its Renaissance-Rococo style architecture and the shows that take place there. It underwent a long time renovation and in 2004 it was opened again. It is located near the Azerbaijan State Museum of Art and if you want to have joyful night during your Azerbaijan trip, watching a concert at State Philharmonic Hall will spice up your moments in Baku. For shopping in Baku, you can head to Fountain Square, Old City and Nizami Street. These places offer so many options for shopping and you can anything you want from electronics to jewelry or souvenirs. However, if you want to buy quality Azerbaijani carpets or rugs, you should visit the shops that are located in the Old City or TsUM. TsUm (also known as MUM) is the largest and the most popular shopping center in the city. Considered as one of the best restaurants in Baku, Fireworks Urban Kitchen is an upscale restaurant that is famous for its nice atmosphere and excellent service. Meat dishes are especially worth trying. It is located in JW Marriott Hotel Absheron. If trying Azerbaijani cuisine accompanying with a breath-taking city view sounds good to you but on the other hand, European cuisine also appeals to you, Terrace Garden will satisfy you much located in the very heart of the city. For a perfect dining experience, head to 20 Boyuk Gala, Old Town (Icheri Sheher). Baku’s jazz tradition is popular and there are really great jazz clubs in the city that you can enjoy a really good jazz music. Caspian Jazz Club is one of the most popular one and it is located in Aziz Aliyev Street. For a great night with live jazz music and nice food, Caspian Jazz Club is an ideal address. Naftalan is located almost 320 km away from Baku but if you have time, it is definitely worth it to go there. The crude oil bath that many hotels in Naftalan offers is known to be good for health and helps curing many diseases from coronary diseases to skin diseases. If you are determined to visit Naftalan hotels while you are in Azerbaijan, it will be wise to book your accommodation beforehand. Gobustan National Park is located only 60 km away from Baku and it is a UNESCO World Heritage Site because of 40000 years of rock art, mud volcanos, and remains of inhabited caves from the wet age. For one of the most interesting experience in your lifetime, you should never skip visiting Gobustan Rock Art Cultural Landscape. Being a fast developing country for it is a cultural and economic center in the region, Baku has always been the center of attraction. Thanks to the remarkable event venues that meet the world standards like Baku Expo Center, many international business and academic events like conferences, congresses, symposiums and trade fairs are held in Baku each year. Eventegg provides you the best accommodation options around the congress venue via the most trusted booking engines.